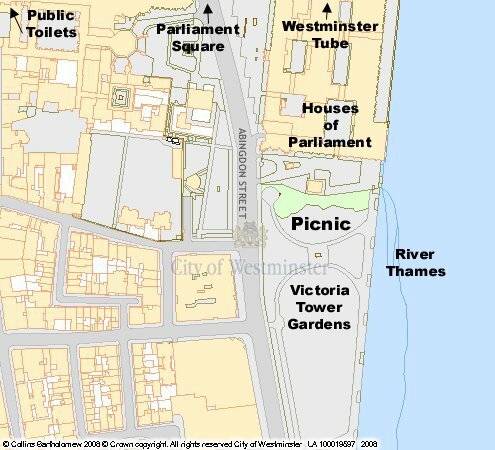 We’ve moved the Westminster Breastfeeding Picnic to Victoria Tower Gardens. In many ways, it’s a better venue – not a roundabout on a hot and merciless traffic heavy square. Cooling breeze off the river. Railed in. Nice tree cover. Traffic crossings! But it’s not the super photo shoot opportunity of the Square. It does give a nice side view of Parliament however. Many thanks to the Royal Parks, for giving us permission. We’re meeting on the crescent area as you enter the park from the Parliament end, by the Pankhurst statue, and tucked behind the Rodin sculpture. It’s a nice stretch of grass, and the kids can run free on the river side, as it is blocked off by an iron gate to Westminster Palace itself. Buses come into this area from all around. 3 and 87 stop on St Margaret Street by the park. The nearest Tube is Westminster. Which is a few hundred yards away, down Bridge Street. Westminster Tube is disabled accessible, so it has lifts from all levels, up to street level. The final little lift up to the street, is the Bridge Street exit. So buggies and strollers are fine from that approach. You literally emerge under the shadow of Big Ben. (And there will be tourists taking photos.) You emerge into a very narrow and crowded pavement – so grab children by hand first. You turn right down Bridge Street, cross the road to the front of the Houses of Parliament, carry on down the entire length of the building, and the gates into the Park are on your left, as you walk past the final policeperson at the far end gates. You can see all this in very good detail, on Google Maps, if you input Victoria Tower Gardens and click to ‘satellite’. Zoom in, and you will see that the Underground is very close. You will also see the trees, statues, swings and Embankment seating. The public toilets are stepped, and 50p, but have a disabled toilet they say. They are underground the green triangle of lawn behind Parliament Square and in front of the Queen Elizabeth Conference Centre. However, six feet away, is Methodist Central Hall, which has a lovely cafe and nicer, free, toilets. It’s in Storey’s Gate, across from Westminster Abbey. It has a lot of fancy stone steps, so if you have a buggy, go for the disabled access entry to the left. The cafe and toilets are one level down, by the lift as you enter. Disabled toilet excellent. Ironically, the nearest toilet and cafe, and a lovely ‘wet weather’ area is actually inside Parliament. Westminster Hall is a wonder to behold, big enough for toddler freedom, has toilets and a cafe at that level, and has a fancy new walkway down to that level. Anyone can enter Westminster Hall, but you have to go through police security. If you have never been in, it is worth a look. If you appear to be part of the event in the Gardens, they may refuse you. So don’t try and enter with banners, badges etc. But if you have time to go through security (anywhere from 3 to 30 minutes) it is well worth a look. You can use a camera in there too. It is illegal to protest, demonstrate or hold a rally within half a mile of Parliament. It is not illegal to have a picnic, celebrate breastfeeding, and raise awareness of issues as long as you have received the proper permissions from the police. So, we are celebrating, and in doing so, raising awareness of an issue close to our hearts – our breasts! 😉 The Royal Parks are even stricter than Parliament Square, we can’t even have a table, or any posters or placards AT ALL. So we ask that no one bring homemade placards or banners. Feel free to wear anything slogany you want to, in terms of t-shirts etc, but bring nothing for your hands that looks like we are protesting. The grass is nice, there is some shade, you may bring brollies etc. The breeze off the river can be sharp – so outer rain/wind wear reccommended, Just In Case. If are a baby wearer, babies and younger toddlers best strapped to you. Older toddlers and young children will need one adult to one child for eye-keeping on the side with the gates to the main road. But there is room for a good run about on the other side, and we’ll endevour to keep the kids on that side. We will have adults without kids there, and we will endeavour to help with games and letting them run about for part of the picnic, but we cannot stress enough that keeping the children safe is a priority. You can bring soft balls for games for children under 5 etc. Good wind for kites. Very small playground with a couple of swings at far end of park area. Bring cameras and take a lot of photos for our photo album. If you have any particular special needs (such as knowing you are bringing a couple of walking kids and there is only one of you) email us and we’ll give you our mobile phone numbers in case you need help etc picnic@dreyfuss.demon.co.uk Also email if you can offer to help. EDIT: Final blog post with photo of where we are meeting. Oh boo! No banners?Thanks for this very detailed blog entry, I’ll be sending it on to others.Has anyone made any flyers or anything that can be printed off and handed to other breastfeeding mums…? Not allowed. Parks are very worried about litter. They get hundreds and hundreds through a tiny park every day, as it’s green and growing in a built up area. And they can’t afford the staff to clear up all that litter, all the time. So anything being handed out, will break the rules.We’re very lucky to be allowed in! 🙂 All that breastfeeding should send the right message ‘tho. Oh no I meant for before the event! Trying to get the word out and encourage more to come along :)I *know* I should do it myself, but somehow I’ve not so far… Wondered if I could take the lazy route if anyone else has already thought of it. I’ve invited people via facebook, but I’m thinking of mums at breastfeeding cafes that might be interested too.